We left our lodge before the break of dawn for a 45-minute drive to Kruger National Park Reserve entrance, bringing our boxed breakfast and bottled water with us. We were warned to limit our coffee or water consumption before the game drive for there were no toilet facilities in the wild. Forty minutes later, I saw an orange glow of light poking through a dark layer of morning clouds hovering over the silhouetted mountain. I pulled out my iPhone to snap a picture of the beautiful scenery to Instagram the picture to my friend who told me that South Africa was touristy. I decided not to take pictures but enjoy the stillness of the morning. I had been on adventure trips enough to know the drill, so I tend to set my expectations low. The beautiful scenery so far seemed to be a prelude to a wonderful safari. We arrived at the gate at 6:00 am where our safari jeep and a ranger named Smart was waiting for us. There were eight of us in the jeep and I felt lucky to be riding with Stu, our guide and Mr. and Mrs. C with high-power camera equipment. With Mr. C’s 800mm lens, I figured he would be able to spot animals from afar. Our guide gave us a few more ‘Do’s and Don’ts” before setting off for the safari like to keep our voice low and not to act as if the animals were pets. We set off on a paved road. I didn’t really care where we were headed, but I noticed the breaking light silhouetting the umbrella trees in front of us, so I knew we were heading east. I heard the revving noise of the jeeps ahead of us fade in the distance. It was replaced by a low buzz coming in from the bushes. Then an elephant appeared, followed by two more elephants. I had imagined that in the wild, we would see the animals from a distance, but they come so close. So close that I could see their big ears and tusks, and their eyes looking at us. It’s surreal seeing a very tall animal ambling across the road. 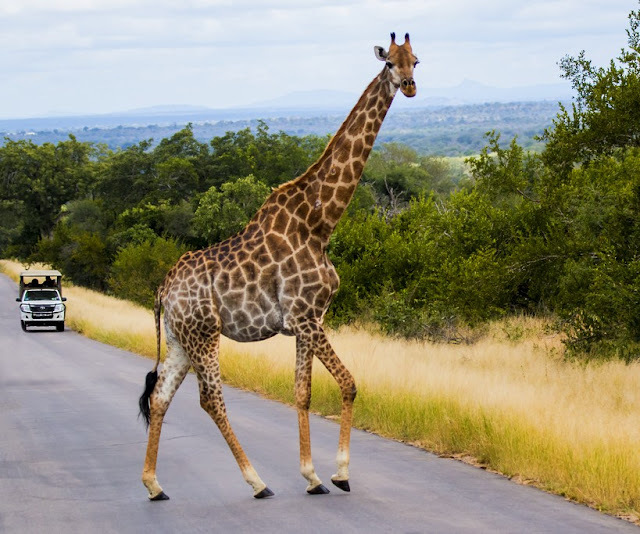 We stopped to take pictures of the giraffe elegantly crossing the road, and to view a handful of giraffes moving like shadows among the acacia trees and chewing off the broken branches. Our cameras had been always ready at a sign of an animal sighting. 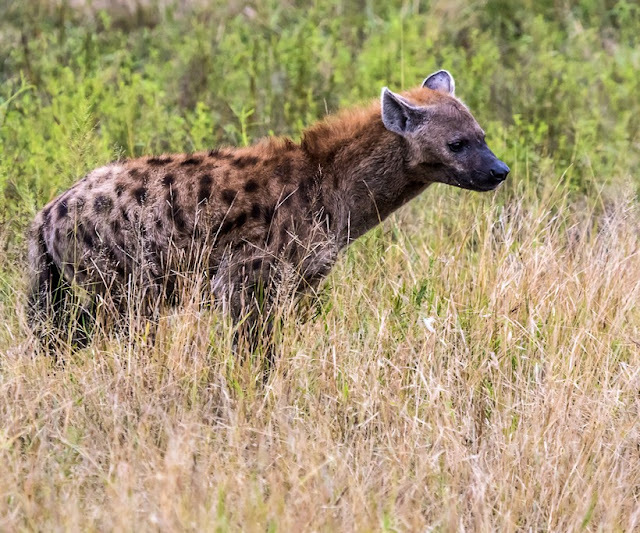 We spotted hyena and colorful birds along the way. After spotting a rhino from a distance, Stu reminded us that we already saw three of the big five (the BIG 5 being the elephant, buffalo, rhino, lion, and leopard) so far. So now we needed to find a lion. At that point, I felt like a tourist who was promised to see the highlights of the tour. Would I really see a lion? Kruger National Park is one of the largest game reserves in Africa with an area of about 20,000 square kilometers. How much of the area do we need to cover to find a lion? I thought. Then I realized that the Rangers must know what they were doing and to make sure that we saw the Big 5 – South Africa biggest tourist draw. I placed my faith in the Rangers who communicate in their native language and who carry walkie-talkies with them. Our ranger was always on the lookout turning his head from one direction to the other looking for signs of paw prints. When the other Rangers spotted some animals, they alerted the other Rangers. News got out that some paw prints had been spotted near the hillside, so our driver revved up to get to the hillside, but we did not see any. Instead, we saw a few baboons frolicking on the rocks. We then headed to the campsite at around 9:00 am for a breakfast break. After breakfast, we hopped in the jeep again to look for the other two of the Big 5s and other animals we have not yet seen. We saw more elephants and giraffes, and impalas. A few minutes later, we saw a couple of jeeps and a private car park on the side, so we assumed that they spotted something. I then saw a herd of elephants parading by the river bank, then hundreds and hundreds of more elephants followed, moving in unison as if to form a black line. The entirety of the black line descended the river and congregated in the middle of the river. I volunteered at the elephant farm in Thailand before, but I had not witnessed such an incredible spectacle. I felt like I was not just watching an episode of planet earth, but I was part of it. I have always dreamed of being able to see such things in real life. 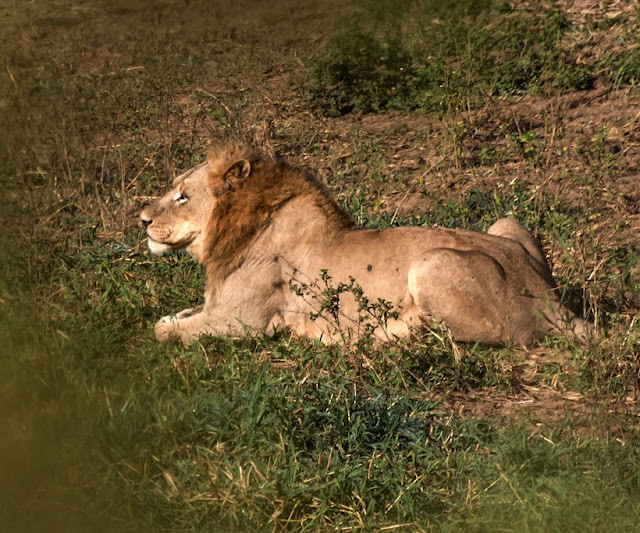 It was an unbelievable sight and at that point, I felt I was really on a safari, and thought that I would go home happy even if I didn’t get to see a lion. 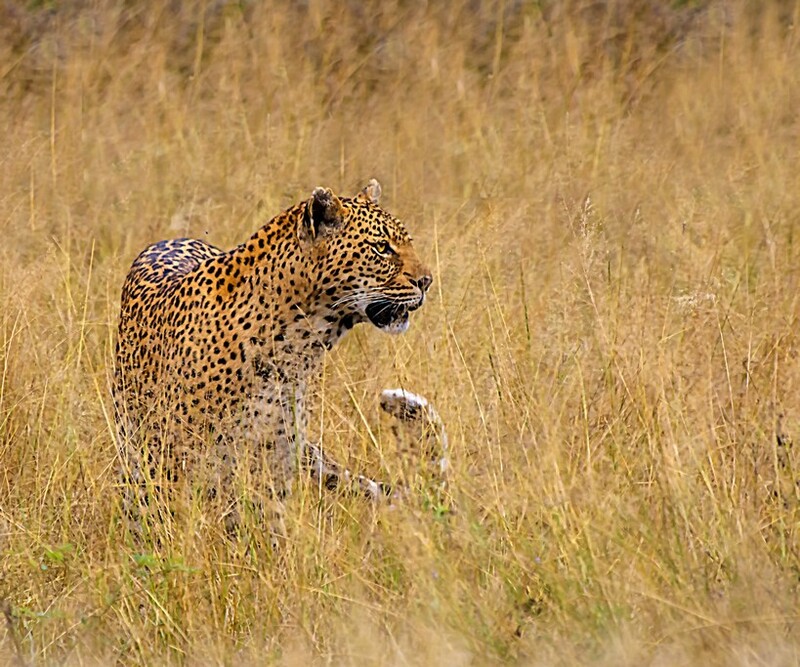 While everyone's attention was on the lion, Smart spotted something else by the riverbank – a leopard moving away from the river. Smart moved as quickly as the leopard and alerted the other rangers to follow, and directed them where to position their vehicle. 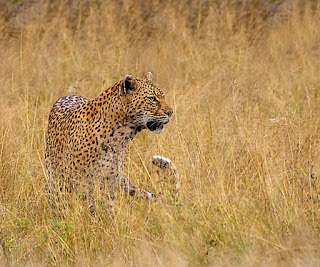 The leopard was behaving erratically, obviously looking for his mate. It moved from one side of the road, disappeared behind the bushes and reappeared. We stood in awe trying to take pictures of the disappearing leopard. For me to witness such animal behavior in the wild is unbelievably exciting, it’s what dreams are made of. I wish I could adequately describe how incredible it was to witness. To be totally honest, a sense of fear crept up on me after seeing the leopard ran from one side of the road to the other. At the same time, I felt a sense of guilt for invading their habitat and hoped that they could care less about our presence. I was pretty sure that our jeep was made for any unpredictable animal attack, and I put my trust on the ranger, whom I thought would know how to react in those kinds of situations. When I expressed my appreciation to Smart for the stirring experience with the leopard, he smiled and said, “I was not named Smart for nothing.” Stu said that Smart knows animal behavior. All the rangers go through heavy training in the Savannah, they know everything about the animal world and they know the area like the back of their hands. You see, the norm is to go on a safari jeep with a ranger, but as a national park, people can go on a safari by driving their own vehicle. They just have to pay the entrance fee. But there are very strict rules like getting off the vehicle while in the national park is prohibited. The fine for breaking the law is severe. After the lunch break, we were at it again seeing more animals – warthogs, kudus and a plenitude of impalas, that after a while our Ranger did not bother to stop the jeep for us to take pictures of the impalas. It was late in the day when I spotted a zebra. After hearing about the zebra as a symbol of balance and equality, I wanted to see more. Smart said that he knew the area where we would find plenty of zebras. I guessed it was reserved for the next day. I never thought I could wake up so happy at 4:00 in the morning. I was psyched up to go on another safari and be ready before the break of dawn. It was the same drill: picked up our boxed breakfast and be at the gate by 6:00 am. We had an old jeep (the typical safari vehicle you’d see in movies) and a different ranger/driver. We set off from the South entrance heading towards the mountain (higher elevation). It was a bit chilly. The road was not paved. We drove through red dirt and gravel road and disintegrated rocks for mile upon dusty mile before seeing an animal. For lack of seeing one of the Big 5’s, a colorful bird became the center of attention. As we reached higher elevation, the vegetation changed from low grass to thick green bushes. 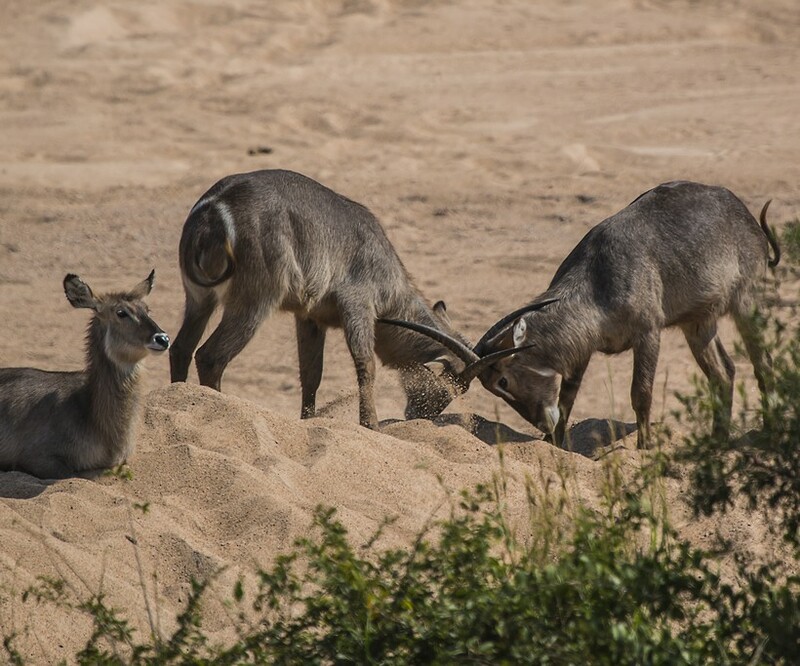 We saw elephants, rhinos, giraffes, and baboons, hyenas, kudus, and impalas. I thought it was not as eventful as the previous day until I saw zebras and fighting kudus. We were treated to such an amazing display of beauty in nature and it was a privilege to see something wild and it just reminds you how amazing and grand life really is. Click on the thumbnail below to watch the trailer. Here are the pictures of animals we saw on day 2.